Recently I was asked if I'd like to take part in the Curvissa Holiday Shop 5 Way Blogger Challenge, a fashion challenge where 5 bloggers including myself were asked to style a piece from the Curvissa Holiday Shop. 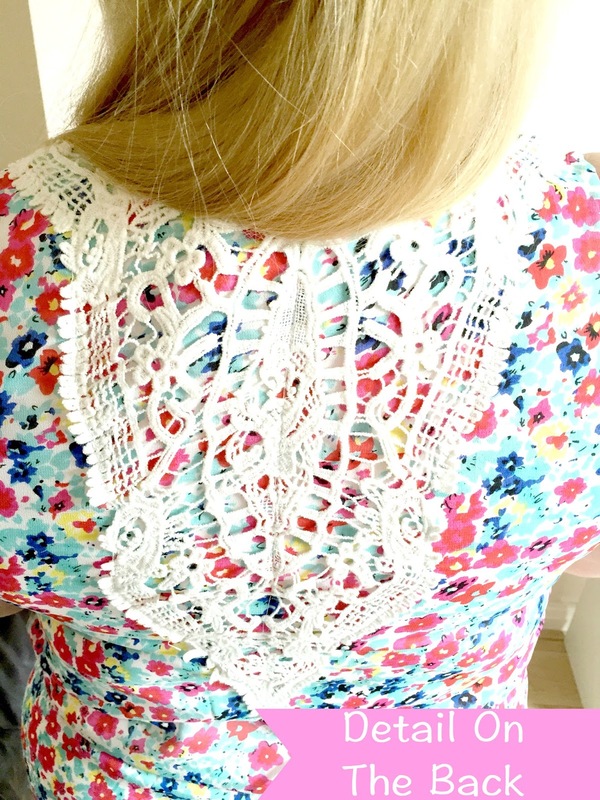 After much deliberation I chose the Floral Print Shift Dress* a brightly coloured floral print summer dress with lace like detailing to the shoulders and back of the dress. I really like the dress and knew I would as soon as I opened the parcel and saw the dress through the clear bag it was packaged in, the colours in the dress are lovely and there's a great mix of lovely summer colours in the dress so it's ideal for pairing with many different accessories. The dress doesn't have any buttons or zips it's a pull on style and very comfortable to wear, I usually wear a size 16-18 and chose a size 18 in the dress, it fits well but is a tiny bit snug on the chest, I do have what you could call an ample chest though so I'm guessing that's why. It doesn't look snug at all but does feel it a teeny tiny bit but not enough to bother me and if I sized up the dress would be far too big everywhere else so if you are a bigger chested lady like me I'd say perhaps order a couple of sizes and see which fits best for you, it's a lovely fit everywhere else though and super comfortable. The dress has cream lace like detailing to the back and a little on the shoulders at the front, I think it's a nice touch and adds something a little different to the dress. The dress feels nice to wear and something I can dress up or down accordingly and also wear here in the UK and when I go on my summer holiday abroad so a really versatile piece for the summer. In the first photograph of me wearing the dress I chose to pair it with some gold sandals (see above) this outfit is perfect for a hot day in the UK or on my holiday abroad. In the above photograph I added some green ballet pumps, picking out the green in the dress, this would be an ideal outfit for the UK if it wasn't quite weather for sandals or abroad if sandals aren't your thing. 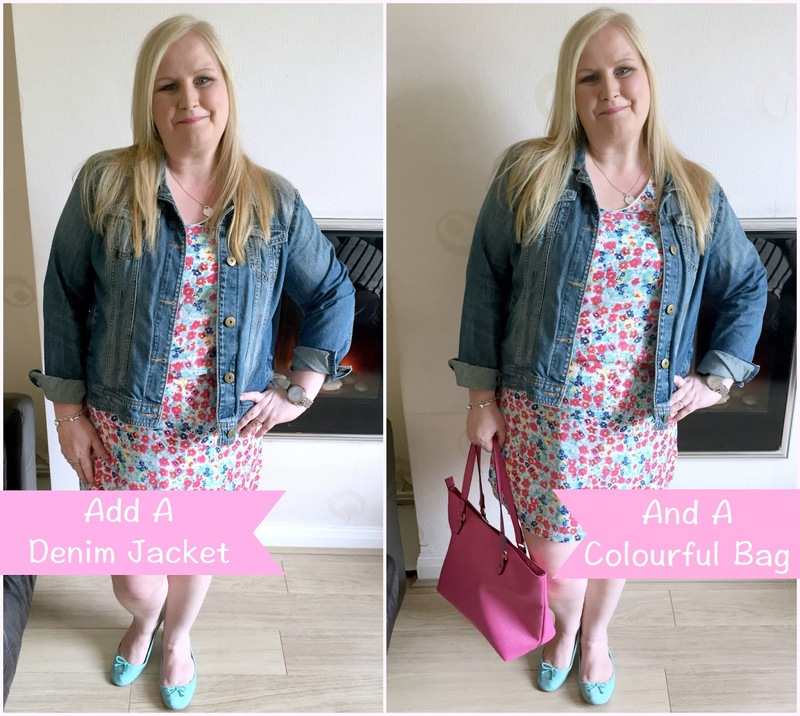 I've also added a denim jacket and a bright pink bag, I think the bag picks out the pink in the dress perfectly. This would be a perfect outfit for a summers day shopping trip or lunch out with Simon and the girls or my friends, I love how the green shoes and pink bag pick out the colours of the flowers in the dress perfectly. I am so happy with the dress, it really is a versatile piece that can be dressed up or down and styled for many different occasions, as I said I could wear the dress as styled in the above photographs for an evening out on my holidays or a shopping or lunch trip with family or friends but I could also wear the dress with a nice jacket, heels and a clutch to a summer wedding or christening, it's a very versatile piece and very pretty too. 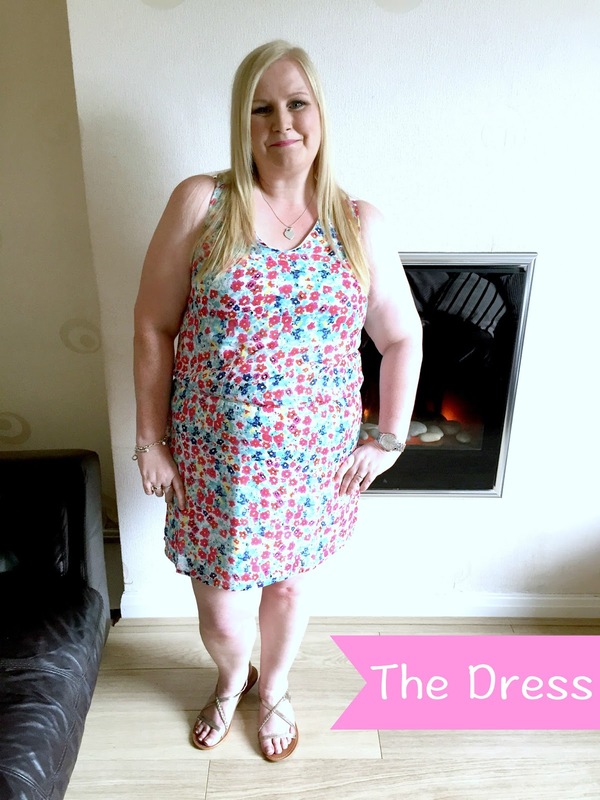 I love the dress and would give it a 5 out of 5, it's a lovely dress, really pretty colours, easy to wear and extremely versatile, I highly recommend you check out the dress and all the other items in the Curvissa Holdiay Shop, there's some great items, you'll be spoilt for choice! Have you checked out the Curvissa Holiday Shop? Which are your favourite items?